On 8th March 2013, Friday, 7:30 PM, I attended the Malayalam Fellowship at the Emmanuel Assemblies of God Church. 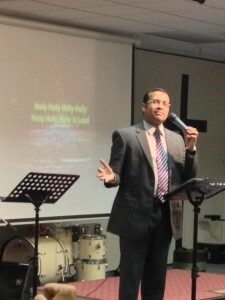 The service was led by Pastor Tinu George from El-Shaddai Ministries, Kottarakara. After my work, I took the MRT to Bedok, and then boarded bus# 16 to the Emmanuel Assemblies of God, Upper East Coast Road. There were about 150 people on the second day. The service started at 7:30 pm with prayers followed by beautiful praise and worship by Anil Adoor and Sham Siva from the El-Shaddai Ministries, Kottarakara. When Jesus asked the Samaritan woman for water, she was surprised because Jews have no dealings with Samaritans and likewise Samaritans have no dealings with Jews. She started rambling about her tradition and her customs. She had married many times but was never happy with her marriage. When Jesus revealed her personal life and failed relationships, she acknowledged He was a Prophet. Only Jesus can give the Living Water regardless of your culture or denomination. Jesus is the one waiting for you even before you come to Jesus. In John 4:24, Jesus taught the Samaritan woman, secret of Worship. God is a Spirit: and they that worship him must worship him in spirit and in truth. You should know who you are. You should know your identity. You should know, you’re the the gift of God. This life, this day, the air you breathe, the children you have, your health, everything that you have, are God’s gift. You must know who is Jesus. Matthew 16:13-1613 When Jesus came into the coasts of Caesarea Philippi, he asked his disciples, saying, Whom do men say that I the Son of man am? And they said, Some say that thou art John the Baptist: some, Elias; and others, Jeremias, or one of the prophets.He saith unto them, But whom say ye that I am?And Simon Peter answered and said, Thou art the Christ, the Son of the living God. For some, Jesus is the healer, for some Jesus is the miracle worker, for some, He’s the debt remover. But we need Jesus because we can approach God only through Jesus. God is Holy and Perfect. But we are born in sin. To approach God, we must be Holy. It’s only the blood of Jesus that can wash away our sins. Jesus said, I am the way the truth and life, nobody can come to Father except through Me. The only medicine for our sin is the sacrifice of Jesus. We must receive this revelation of Jesus. The Samaritan woman perceived Jesus as the Jew first, then as a Prophet, then as a Teacher and finally as the Messiah. As you come closer to Jesus, you get the greater revelation. You must know your greatest need. This entry was posted in Malayalam Fellowship and tagged Pastor Tinu George. Bookmark the permalink.